Are you getting analytics on what brought a person in? Are you leveraging opportunities for expanding membership base? Museums with free admission struggle even more in getting reliable analytics on visitors. Often electronic counting solutions are implemented that just give basic counts on visitors. 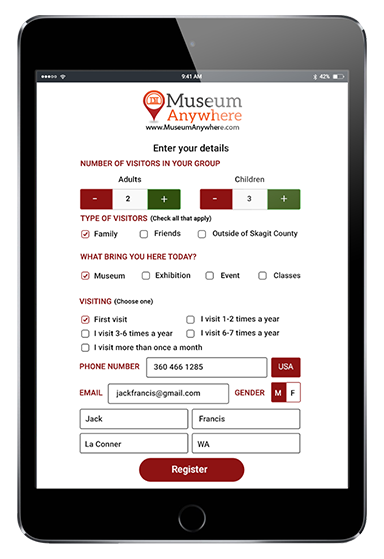 Why not implement Visitor Sign In-Tablet Kiosks to gather info you can use within the museum and with museum benefactors? It’s an inexpensive solution with significant ROI. With just a few questions, Visitor Sign-in Kiosk solution from MuseumAnywhere team can identify a repeat visitor and also get valuable analytics for you. Analytics on what brought them in – an event, an exhibition, an educational session etc. Analytics of where they come from and opportunity to get info for targeting for events or exhibition announcements or increasing your membership base.